The best time to clean and paint your new home is before you move in. The wide-open spaces are much easier to deal with. This is also a good time to put up shelves in the garage, line your cabinets and hang curtains. Once your possessions are all move in, you have a chance to start fresh and organized. That is why it is vital that you don’t move your old junk into your new home. One call to Junk King St. Petersburg can stop that from happening. Everything you take out of your house has to be packed. That means you get to decide to “keep” or “toss” every book, article of clothing, pot and piece of furniture. You might decide as you pack that you can actually do away with a lot of this stuff. Maybe you’ve outgrown some things. Maybe something is broken and you don’t want to get it fix. For every other unwanted item, it could simply be that you’re replacing it at the new place. All of that unwanted stuff can be turned over to Junk King. By hiring Junk King to take away your old junk before the move, you’re actually freeing up space on your moving truck. You’re also maximizing your movers’ time. They will be charging by the hour. You don’t want to pay them to move things that you can do without. All those things you want to get rid of won’t go to waste with Junk King St. Petersburg on the job. This is a company that is dedicated to diverting as much junk away from landfills as possible. The company has managed to maintain a respectable 60% diversion rate, which is helping the state achieve zero waste. That is a goal everyone can get behind. 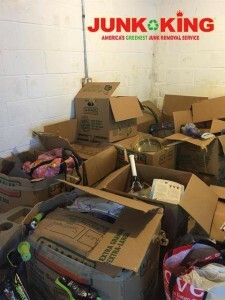 You can set up your junk removal session with Junk King before the big move day. That way there won’t be any confusion with what to take. You’ll feel a lot better getting rid of all that clutter. It’s always a smart move to let Junk King St. Petersburg move out your old junk. This entry was posted in St. Petersburg Junk Removal and tagged clutter, junk, junk king, junk removal, move on October 31, 2017 by Junk King. Last updated November 3, 2017 .